A random sample of 457 neonates was prospectively studied in order to identify the incidence, common types, and risk factors for arrhythmias in the neonatal intensive care unit (NICU). A 12-lead EKG was studied in all neonates (n = 457). A total of 139 Holter studies was done in every fourth baby with a normal EKG (n = 100) and in all babies with an abnormal EKG (n = 39). Of the 100 infants who were thought to be arrhythmia-free by EKG, nine infants demonstrated an arrhythmia on Holter studies. 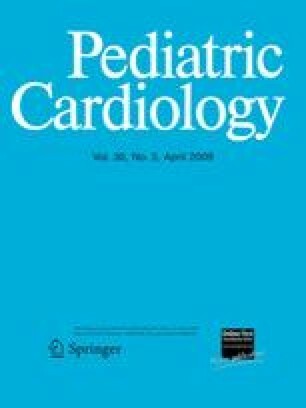 When we correlated screening results with maternal, obstetrical, and neonatal risk factors; arrhythmias were significantly associated with male gender, more mature gestational age, lower glucose levels, maternal smoking, high umbilical artery lines, and the use of the nebulized β-2 adrenergic treatment, whereas umbilical venous lines and dopamine infusion did not relate to arrhythmia. We conclude that arrhythmias are more common in the NICU than in the general neonatal population. Compared to Holter monitoring, the sensitivity of the EKG was only 89%. We thank Cynthia Poindexter for her work in revising this manuscript.